In early January, Wikipedia user Hillbillyholiday put in a request for comment on Wikipedia regarding British tabloid the Daily Mail. “Should we prohibit the use of The Daily Mail as a source?” wrote Hillbillyholiday. “I envisage something just short of blacklisting, whereby its introduction to an article could be accepted only upon there being a demonstrable need to use it instead of other sources.” A lengthy, monthlong discussion followed, at the end of which time Wikipedia’s editors voted, and a decision was reached: Daily Mail will no longer be used as a source. In its description of the decision, editors summed up the pro-ban arguments as “centred on the Daily Mail’s reputation for poor fact checking, sensationalism, and flat-out fabrication.” While they noted that there are subjects on which the Mail is reliable, they advised editors to find other sources where available. 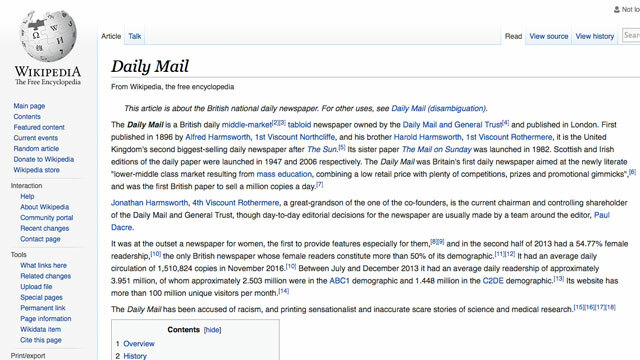 The result of the vote is already up on the Wikipedia page for the Daily Mail. Source? Jackson’s story.